Sunshine, unlike many other guilty pleasures, has many benefits. But let’s face the facts — too much of anything can be bad. Yes, too much sun can be bad for us. In fact, there is more and more research coming out about the benefits of vitamin D. Surprise? yes — guess what the best source of vitamin D is — sun exposure. Now tell me — when is the last time you could get your vitamins, have fun doing it and look great afterwards? One thing you must remember when you’re heading to the beach is most sunscreens, tanning lotions and even spray tanning products have very toxic ingredients and should never be applied to the skin. They are supposed to help prevent cancer by blocking the sun’s rays or offering alternative ways of getting a tanned-looking complexion, but sadly, the opposite is true. Skin cancer is on the rise and these products are most likely contributing to it. In fact, skin cancer is the most common cancer in the USA accounting for almost half of all cancer cases. Perhaps it is time to stop blaming the sun and reassess the actual cause of skin cancer. 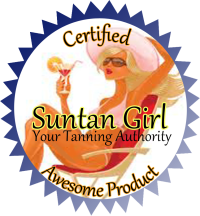 It is more apparent all the time that if we are going to ‘tan’ we should use a natural suntan oil. I found a great one — Hula Tan. It’s all natural and I feel like it’s the best thing you can put on your skin. Dioxybenzone – strong evidence of skin toxicity and carcinogen; hormone disruptor and has been found in waterways, soil and air. Has been shown to have a “gender bender” effect in animals. Does it make any sense that in order to prevent skin cancer, we need to slap on carcinogenic compounds and chemicals that interfere with our immune and reproductive systems and that also pose a risk to the wider environment? Millions of gallons of sunscreen are consumed each year. After application, it doesn’t mysteriously vanish – it winds up either soaking into our bodies and accumulating there or is excreted (into the environment) or washed off; again — into the environment.